Ten years before: Oliver is one of seven young Shakespearean actors at Dellecher Classical Conservatory, a place of keen ambition and fierce competition. In this secluded world of firelight and leather-bound books, Oliver and his friends play the same roles onstage and off: hero, villain, tyrant, temptress, ingénue, extra. But in their fourth and final year, the balance of power begins to shift, good-natured rivalries turned ugly, and on opening night real violence invades the students’ world of make believe. In the morning, the fourth-years find themselves facing their very own tragedy, and their greatest acting challenge yet: convincing the police, each other, and themselves that they are innocent. 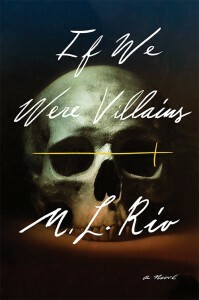 ‘Much like Donna Tartt’s The Secret History, M. L. Rio’s sparkling debut is a richly layered story of love, friendship, and obsession. Both comic and tragic, this novel asks what people are willing to sacrifice in the name of ambition. Expertly plotted, beautifully written, If We Were Villains will keep you riveted through its final, electrifying moments.’ CYNTHIA D’APRIX SWEENEY, bestselling author of The Nest. ‘This is a rare and extraordinary novel: a vivid rendering of the closed world of a conservatory education, a tender and harrowing exploration of friendship, and a genuinely breathtaking literary thriller. I can’t recommend this book highly enough, and can’t wait to read what M. L. Rio writes next.’ EMILY ST. JOHN MANDEL, bestselling author of Station Eleven.